Prof. A. K. Mathur is a Director General of Roorkee Institute of Technology, Roorkee. 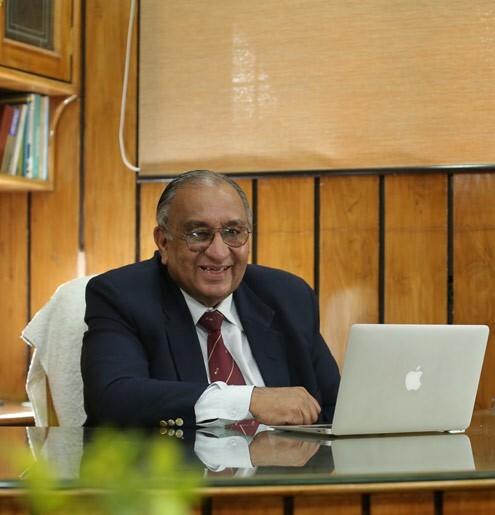 Prof. A. K. Mathur has more than 40 years of Academic and research experience. Prof. A. K. Mathur completed his B.E. in Civil Engineering in 1963 from Jodhpur University then completed M.E. (Civil Engineering) in 1965 from University of Roorkee. He is author of more than 15 research papers in national and international reputed journals and Prof. A. K. Mathur guided M.Tech. thesis of 16 students. Prof. A. K. Mathur has also been associated as a member in panel experts with AICTE, UPSC & other National Organizations. The rapid developments in the field of technology have accelerated the demand for value based engineering education which is qualitative, progressive, multidimensional and globally competitive. With this end in view, we at RIT cater to the needs of engineering aspirants in the core branches of engineering, science, management and education. These streams of learning would be more useful with positive results for those who wish to go for Masters Degree. Pursuing Engineering, Management degrees and other undergraduate courses is not only that we dream of and practice. We want to make it value based, inspiring and multifaceted, by instilling a feeling of self discipline, a good team player’s spirit, sense of responsibilities, dedication and devotion to duty. We give them motivation, ideal environment for learning through Interactive and investigative classroom learning, tutorials, lab experiments, practical exposure to industries and of course, through co-curricular activities, so that they come out as professionals with all round development, with a mission to do service to humanity as a whole, with their professional excellence. RIT is a saga of rapid progress made within a short period of time where building a balanced, technologically sound personality is a mission. The aim of RIT’s active Placement Cell is to ensure 100% placement for all of its students. Stringent efforts are made to place our students in encouraging positions in the industry that can matchup with their expectations of good lifestyle. You are welcome to write the script of your own success story.